Dr. Kevin Hopkins, president, U.S. Aquaculture Society, presented the U.S. Aquaculture Society Distinguished Service Award to Dr. Carole R. Engle, director of the Aquaculture/Fisheries Center of Excellence, University of Arkansas at Pine Bluff. Photo courtesy of Fish Farming News/Rick Martin photos. The award recognizes individuals who have made outstanding personal contributions to the U.S. Aquaculture Society, a chapter of the World Aquaculture Society, and/or the U.S. aquaculture industry. It emphasizes significant leadership and overall impact in research, education, Extension or industry development in the field of aquaculture. Under her leadership, the UAPB Aquaculture/Fisheries Center of Excellence developed the university’s first research-based Master of Science program and its first doctorate program. She has taught 14 different graduate and undergraduate courses related to agricultural economics and aquaculture. Dr. Engle’s research focus is catfish production economics and farm management, catfish marketing, optimal management of catfish farms, aquaculture economics and marketing. She has published four books, 105 refereed journal articles, 46 book chapters and monographs, 19 proceedings and 78 Extension publications. Her economic-based research related to effluent guidelines, food safety and inspection services, invasive species, federal assistance programs, and risk management programs, has been especially significant. “Because of Dr. Engle’s efforts, UAPB’s Aquaculture Center has become ‘the go to place’ for numerous federal and state regulatory agencies whether they are dealing with disease outbreaks of Viral Hemorrhagic Septicemia (VHS) and Spring Viremia of Carp (SVC) or if they need economic data to justify their proposed actions,” Ted McNulty, director of aquaculture, Arkansas Department of Agriculture, said. Dr. Engle serves on many advisory councils including the U.S. Secretary of Agriculture Advisory Committee, the Monterey Bay Aquarium Science Advisory Board, the Joint Subcommittee for Aquaculture’s Task Force on Aquaculture Effluents, the U.S. Fish and Wildlife Service’s Asian Carp Working Group, Steering Committee for the U.S. Department of Agriculture Catfish Forum, and Technical Committee for the Southern Regional Aquaculture Center. She currently serves as the editor or lead editor for the leading journal in aquaculture economics, associate editor for two other journals, and as a reviewer for more than 20 different scientific journals and funding programs. She is only one of two people to have twice received the Joseph McCraren Award from the National Aquaculture Association. 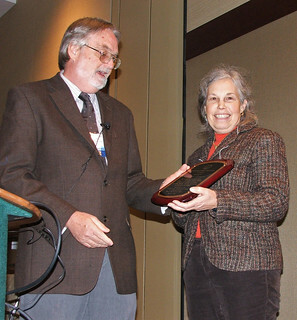 She was the recipient of the Researcher of the Year Award from the Catfish Farmers of America, the Distinguished Service Award from the Catfish Farmers of America, Service Award from the from the Catfish Farmers of Arkansas, USDA Service Award for service on the Joint Subcommittee for Aquaculture Effluents Task Force, and the Harvey McGeorge Award of Distinguished Contributions to Agriculture.